We're almost halfway through 2017, and London has already seen so many brilliant pieces of theatre, from searing new plays to joyful musicals, and everything in between. 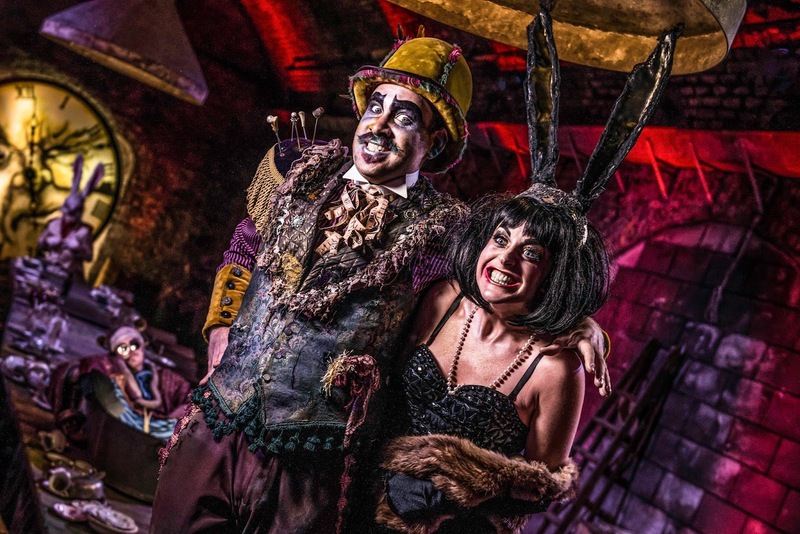 However, if audiences are looking for an artsy night out which offers something a bit different, then the answer to their theatregoing dilemma lies in The Vaults underneath Waterloo station, in the sprawling and fantastical world of Wonderland. Yes, the 2015 Olivier Award nominated Alice's Adventures Underground is back, and very literally bigger than ever. The vast and labyrinthic world of Wonderland has yet again been brought to vivid life in an incredibly ambitious piece of immersive theatre which will inspire awe in all who dare to venture down the rabbit hole. Audiences are shepherded into Wonderland together, via a room filled to the rafters with eerie Victorian curio. After taking the plunge into Wonderland itself they are met by non other than the White Rabbit, and are soon siphoned off in different directions, after either eating a growth inducing sweet or drinking a shrinking potion, and subsequently being sorted into a suit (either hearts, diamonds, clubs, or spades) which they swear loyalty too throughout their time in Wonderland. There are dozens incredible and eclectic characters inhabiting Wonderland, each of which is brought to life through the use of outlandishly designed costumes and makeup, as well as some impressive puppetry. No matter which route is taken, or which suit is selected, audiences are bound to have a blast as they are lead into the bizarre and nonsensical world of Wonderland, and treated to a number of memorable performances, such as a gravity defying gymnastic routine courtesy of Tweedle Dee and Tweedle Dum, a sombre musical number performed by the Mock Turtle, and even an invitation to join the Hatter, Dormouse and March Hare for tea. If only there were enough time to visit every single room, and interact with every single character within the story. Happily though, each group of audience members is taken on their own individual journey, and given enough time in each room to really take in the wondrous world which they are permitted to inhabit, if just for a short while. Whilst wandering through the unfathomably numerous rooms, each of which are filled with an almost unbelievable level of detail in set design, lighting and sound design, it's almost impossible to imagine how many different rooms there are to explore within the production. Of course the individual paths of each group overlap occasionally, but for a large portion of the time audiences embark on journeys within relatively small groups, and rarely cross each other. There really is nothing else in London right now quite like Alice's Adventures Underground. The multitude of different potential paths through Wonderland make it a truly unique piece of immersive theatre which audiences will want to lose themselves in again and again.